Your choice of 1950 for a starting date causes some odd conclusions. 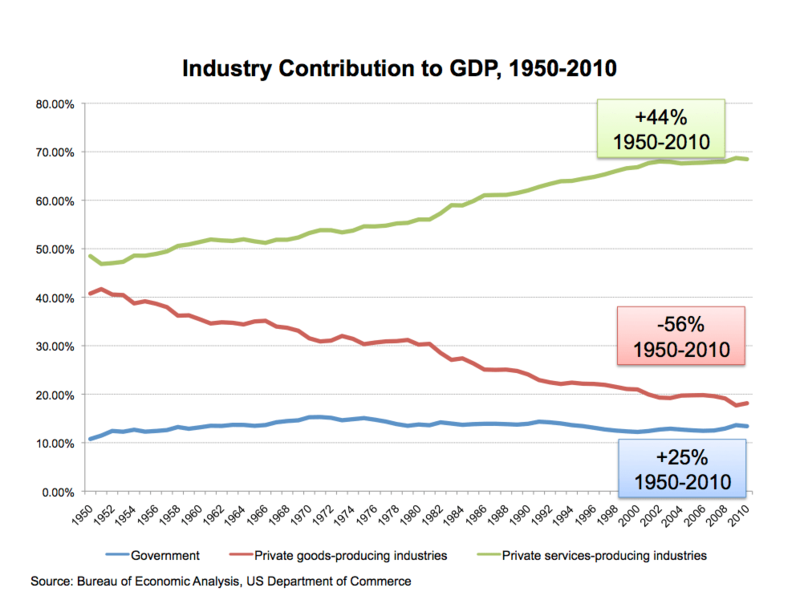 For example, government spending has shrunk considerably since 1980 (and even more so since 1965)– I am not sure why you are saying it is “up.” If you further analyzed it you would find that a large fraction of the increase is increased per-employee/beneficiary health care costs, which is independent of “big government”. When airlines’ costs skyrocket due to oil price rises, we don’t ask whether they are mismanaged. 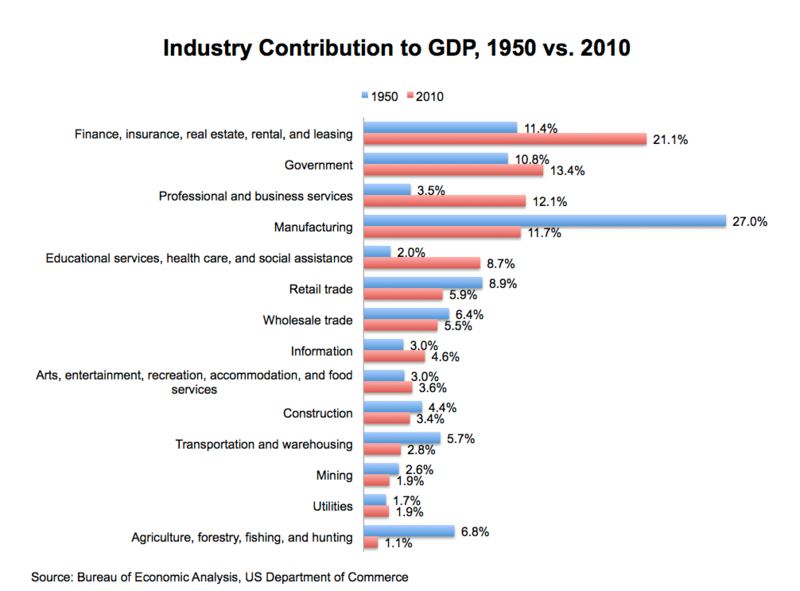 Also in 1950 Europe and Japan were still rebuilding and SE Asia wasn’t yet industrialized, so the US had something like 80% of world manufacturing GDP by default. WRT “the two dominant private industries in our country – finance and health – require significant regulation, hence the rise of Treasury and Health,” Googling for “department of health and human services budget breakdown” returns as the top hit a link to hhs.gov; the 4th page of the linked report for 2010 is a pie chart showing that 52% of the spending is Medicare and 33% Medicaid — so not regulatory activity, but transfers to doctors for treating the old and indigent. 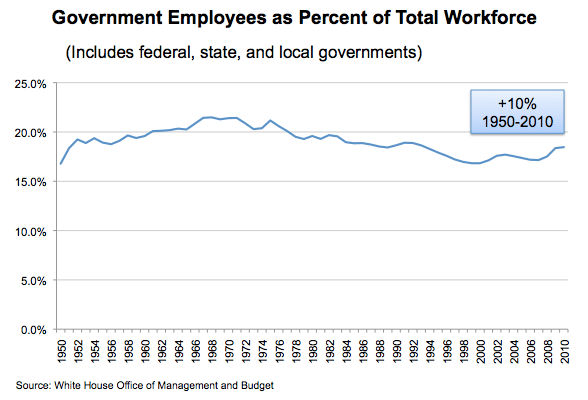 Regarding government’s share of the labor market: http://modeledbehavior.com/2011/09/16/where-is-the-middle-class-going/ . 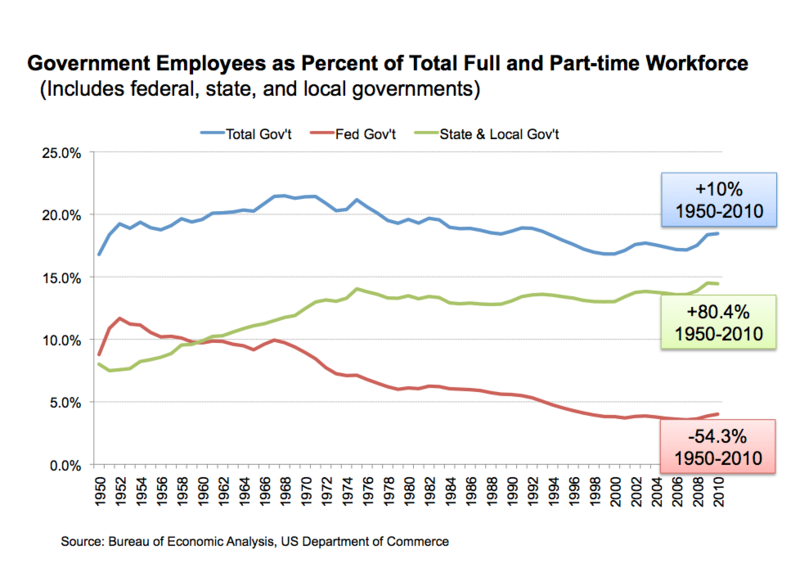 With regard to “As local governments have taken over the once Federally run education system, payroll there has skyrocketed (has performance? Nope. But that’s another story),” you might ask yourself who went to college in 1950. The answer is a true elite. It wasn’t until the mid-60’s that half of American adults had a high school degree. The typical student in college in 1970 was the son of a rich family who’d received an excellent high school education. The typical college student today is a much tougher job for her professors. Baumol’s Cost Disease also applies. “The once Federally run education system” ???!!!!??? What??? When did the Federal government run the education system? Money, is the main thing. Remember prop 13 in CA ? The outlays chart isn’t just admin payroll outlay, is it? The growth in SS and HHS depts is surely recipient benefit expansion, rather than increases in admin/reg, no? I think so. Great comments from all. Really help me get smart on this. 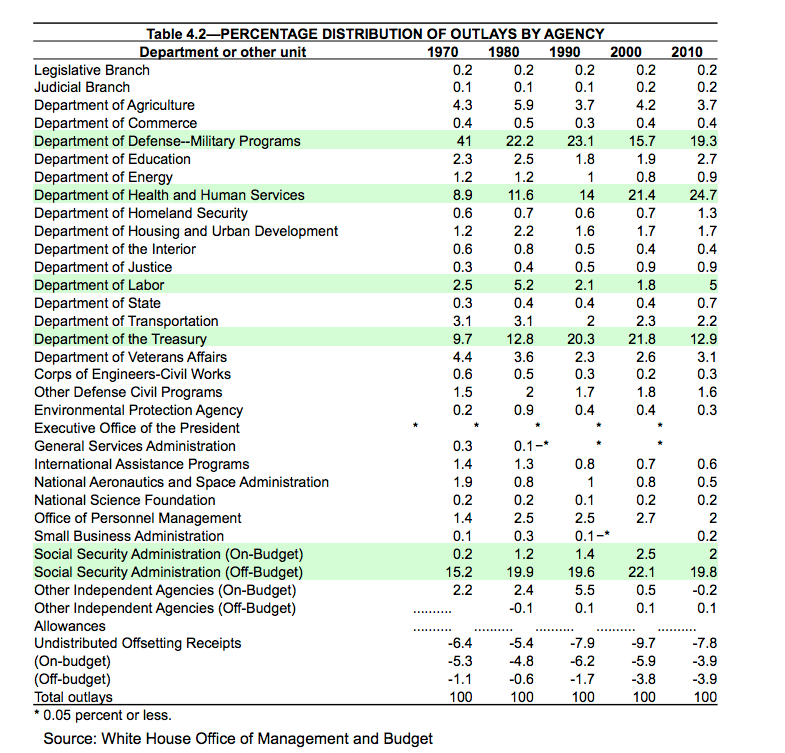 The outlays are total outlays, not payroll. Table 4.1 has the hard numbers, 4.2 lists the percentages as shown here. Slightly off the main point but I’ve had this question for a while: Aren’t social security numbers outdated? We are relying on a “technology” (which is crucially important to our identity – online identity even more so in the future) that was created in 1935?! Why? Great post. However all is still founded in the SSN — Like your Visa. Facebook is not. To get the SSN, they either need the payment companies, or, they need to break totally. If they make such a break, it would be historic. Interesting presentation.. hope to see some improvements on these numbers.. IF OBAMA’S HEALTH PLAN IS MOSTLY PRIVATE, THEN WHY THE NEW TAXES? MEDICINE, I WAS LOSING MONEY ON EVERY MEDI PATIENT I SAW. Who would love to swim with me. How would your analysis text change if you’d selected a 40-year horizon: 1970 to 2010? 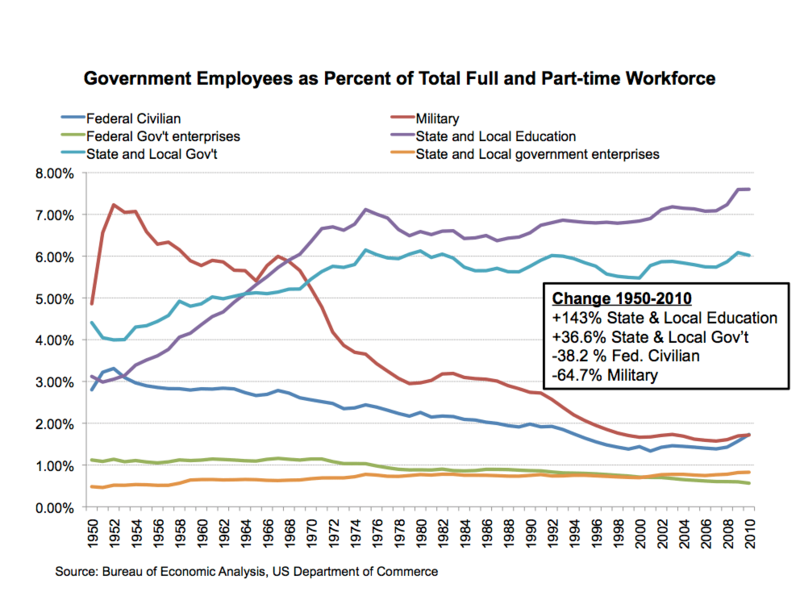 Eyeballing the graphs, it looks like it’d be a 20% decrease in government size, huge decrease at the federal level, and perhaps 20-40% increase at the state level. The color combination is good. I think Christian Louboutin black leather Roman 120 button detail bootie design stitches are quite difficult than reguler. Tory Burch flats is as well as the Alhambra, Daniella, Stephanie. Each pair of these shoes provide its delicate style,especailly suitable for ballet.Having several collections if 2011 and 2012,Tory Burch flats are superb for various occasions – silk tunics for that evening along with cotton one. Next Next post: What Role Government?